Canon U.S.A. today announced the revolutionary Cinema EOS-C700x Professional 4K Camera System, with a new CMOS Super-35 extended-size sensor, showcasing their most advanced ultra low-noise EOS imaging system. 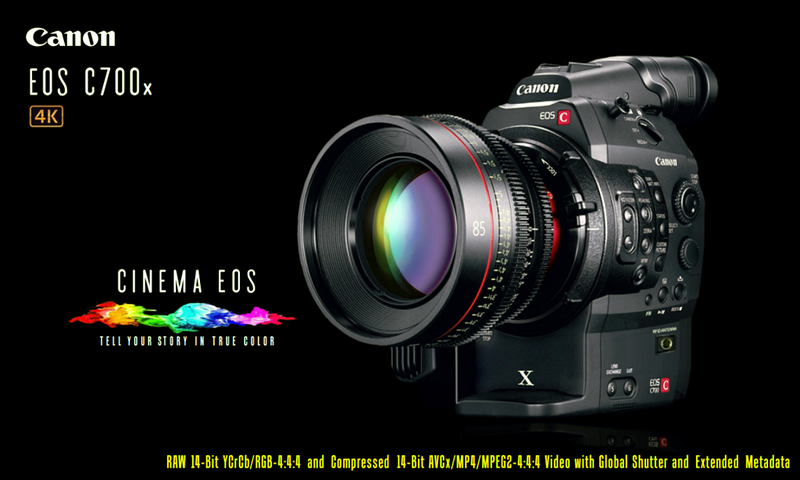 With a Global Shutter that does away with line-skew and containing 1.3x larger photosites than our previous EOS-C500, EOS-C300 and EOS-1D C cameras, the EOS-C700x camera offers premier quality cinema imaging with up to 15 stops of latitude for the highest dynamic range and superior color reproduction even in ultra low-light situations. True color 4k RAW 4:4:4 YCrCb and RGB at 14-bit color depth is the new baseline of quality for Canon's EOS Cinema series of cameras. Leaping forward in cinema production technology, we are also introducing the numerous additions and improvements to base user functionality and the latest in high-resolution and high frame rate video recording and web-streaming options. Hot-Swappable Compact Flash Card and Hard Disk Recording Cartridges Canon introduces the CTF-701 and the CTH-702 ThunderBolt video cartridge system which allows EOS-C700x users to record multi-format video onto three internal compact flash cards or three 2.5" hard disks at multi-terabyte capacities. These cartridges are inserted into the EOS C700x camera body to allow sequential recording onto three drives, recording of three copies of the same program for maximum data safety and backup capability, or record one video stream into three different container formats, frame sizes and frame rates for maximum production flexibility. These ThunderBolt-connected cartridges can be quickly hot-swapped so that recording is not interrupted. With an aggregate data rate of up to 20 Gbps, the fastest data recording speeds are supported at the highest levels of video and audio quality. Containing three removable 128GB, 256GB or 512GB high-speed Compact Flash Cards (CTF-701) or three removable 1TB, 2TB or 3TB 2.5" 15mm hard disks (CTH-702), a large number of recording options is now available for balancing media cost, recording times and connectivity during your production and post-production phases. Multi-format Recording and Live Streaming. The EOS C700x camera now has multi-format recording capability with recording full resolution 4096 x 2160p 60fps video to MOV, AVI and MPEG4/MPEG2 container file formats using full 4:4:4 color sampling. We also include 2048 x 1920p, 1080p, 720p and other more web-centric recording formats at multiple frame rates for maximum post-production and web streaming flexibility. Higher frames including 2048 x 1080p and 1920 x 1080p @ 120 fps, ultra slow-motion 1280 x 720p and 1024 x 768p @ 150 fps, 960 x 540p @ 240 fps, 640 x 480p @ 300 fps and even 512 x 512p at 600 fps is now supported. In addition, live streaming of full size and full frame rate CLEAN video through the HDMI, 3G-SDI and DisplayPort connectors allows for ultimate flexibility in external recording options and video monitoring capabilities. We have extended the ability to stream, monitor and record during live productions using the built-in 801.11ac Wireless EOS Webserver to allow up to 8 users or devices to each receive a combined Video/Audio/Metadata stream of up to 100 Mbps. A built-in RJ45-Cat-6 Gigabit Ethernet connector and 20 Gbps ThunderBolt connector extends that functionality to high-speed wired networks, attached network storage and external digital video recording peripherals. Critical Focus Video Monitor The newest Canon EOS C700x monitoring unit now has one of the clearest and sharpest high resolution color OLED video displays today. At 1920 x 1080 this display is ideal for your critical focusing needs during live multi-camera and single-camera cinema productions. Attached to the EOS C700x carrying handle, the bright, high-dynamic range OLED video display provides a superior color rendition that makes the EOS C700x a joy to use during fixed-base and hand-held operation. With the New Metadata Extensions, Canon introduces the Open Format EOS XML METADA SPECIFICATION 1.0, which allows all newer Canon Cinema series, professional broadcast series and DSLR cameras to send and receive critical Metadata via built-in data ports and embedded within the AVI, MOV and MPEG4/MPEG2 container file formats. Production-specific metadata such as camera type, production and personnel information, system setup and more, is recorded at the beginning of each press of the record button while clock time, time code, elapsed time, GPS location data, 3D-XYZ orientation, 3D depth map data and custom user data is recorded for every frame within a separate metadata track that can be extracted and saved into various spreadhseet, delimited text, XML and database formats for post-production and on-set production needs. The metadata is also streamed out LIVE through the USB 3.0 port and via the metadata extensions outlined within the latest HDMI and DisplayPort specifications. The onboard 3D-XYZ MEMS Orientation Sensor and onboard GPS Location Sensor ensure that production and post-production personnel know when, where and how the camera was positioned within 3D space. With the addition of the RFID tag sensor, Up to 128 talent and on-set objects can queried wirelessly up to 200 metres away to find out their GPS position, 3D orientation and dates/times on your production sets. That production metadata is also saved into the output container files and also streamed live out the camera's HDMI, DisplayPort, RJ45 and USB 3.0 data ports. Four-Channel Audio at 24-Bit, 192 Khz Sampling Canon has upped the audio quality level in the new EOS C700x via the four onboard balanced XLR connectors that have their line-or-mic level signals digitized at up to 24-bits at 192 kHz using custom Digital Signal Processors and premium Analog-to-Digital converters. This premium audio quality makes the EOS C700x perfect for large scale productions. Further announcements from Canon with additional specs, list price and estimated delivery schedule will be forthcoming at the 2015 NAB Show from April 13 to 16 in Las Vegas.